You may have thought it would never happen, but if you over-condition your hair, it may feel too soft and very slippery. Over-conditioned hair may even repel itself as though you rubbed a balloon on your head. Limp or greasy looking hair or hair that looks puffy and undefined are signs of over-conditioning. To help reverse this, wash your hair with shampoo and use much less conditioner or simply just a lighter formula. 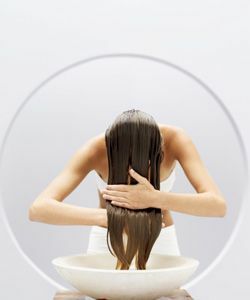 You might use a protein treatment, which tends to counter the soft, mushy feeling by strengthening (“stiffening”) hair. You can do this at home by beginning with an apple cider vinegar rinse to remove excess oils. However, “over-conditioning” can also refer to a build-up of emulsifying emollients in conditioners which can be difficult to remove without the help of a surfactant or a mild abrasive like baking soda. Once you have done this, use a protein treatment like Spiral Solutions Repairing Protein Treatment to restore strength and resilience to hair. Overall, don't worry! Over-conditioned hair completely reversible, so keep trying and avoid deep conditioning treatments or using too many “conditioning” styling products.